Who Discovered the Milky Way? Head outside at night, far away from bright cities and you’ll see a beautiful streak of light splashed across the sky. That’s the Milky Way; of course, it’s really the vast collection of stars contained in our home galaxy. But who discovered the Milky Way? There’s no way to know who actually first noticed the Milky Way. You can see it with your unaided eyes, so our paleolithic ancestors would have seen the Milky Way every clear night. So perhaps a better question to ask might be, “who discovered that the Milky Way is a galaxy”? Ancient Greek philosophers proposed that that Milky Way might be a vast collection of stars, to dim to make out individually. But the first actual proof came when Galileo Galilei pointed his first rudimentary telescope at the Milky Way in 1610, and was able to see that the Milky Way was made up of countless stars. In 1755, Immanuel Kant proposed that the Milky Way was a large collection of stars held together by mutual gravity. Just like the Solar System, this collection of stars must be rotating and flattened as a disk, with the Solar System embedded within the disk. Uranus discoverer William Herschel attempted to actually map out the shape of the Milky Way in 1785, but he didn’t realize that large portions of the galaxy are obscured by gas and dust, which hide its true shape. It wasn’t until the 1920s, when Edwin Hubble provided conclusive evidence that the spiral nebulae in the sky were actually whole other galaxies. This helped astronomers to understand the true nature and shape of the Milky Way, and also discover the true size and scale of the Universe around us. 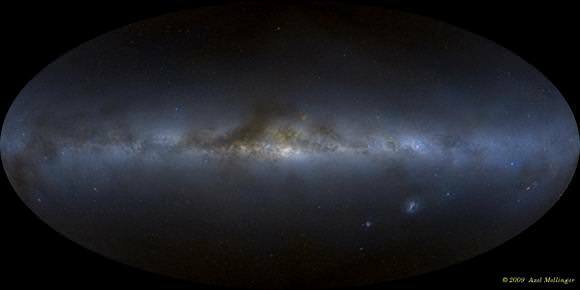 We’ve written many articles about the Milky Way for Universe Today. Here’s an article about how many stars are in the Milky Way, and here’s an article about how many planets there are in the Milky Way. Previous PostPrevious How Hot is the Core of the Earth?